I was eager to get out of Trujillo, in the week I was there I had seen only a few hours of sunlight. When I arrived after coming down from the mountains I was sure it would be warm, as it was on the coast and in the tropics. But because of cold ocean currents or other meteorologic phenomena, the sky was overcast the whole time and folks were out and about it gloves and scarves. 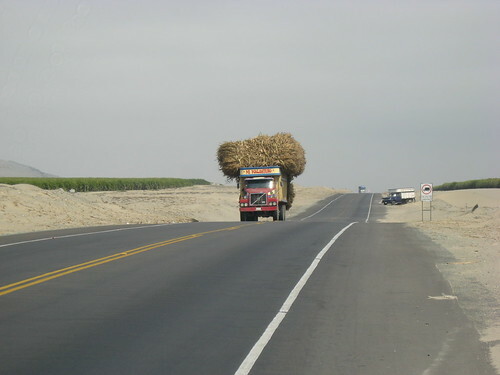 The 5o miles south of Trujillo marked the first time I had been on the Panamerican Hwy in Peru, and it was a reminder why I’ve been avoiding it and the coast so far. Bleak, windy, though to be fair, generally a good shoulder the whole time. I loose a bolt for my chainring, as I had only finger tightened them in Trujillo while I was tuning the bike and never got around to clamping things down. Despite many thousands of miles on the road, this was the first time I’ve changed chainrings, and always learn something new every time I tune the bike. Even obvious things like tightening super-important bolts. I passed lot of agriculture, which I found odd as the sand and rocks that seem to cover the area doesn’t seem very fertile. But somehow through the magic of irrigation and probably lots of chemicals, you can grow anything from grapes to asparagus. 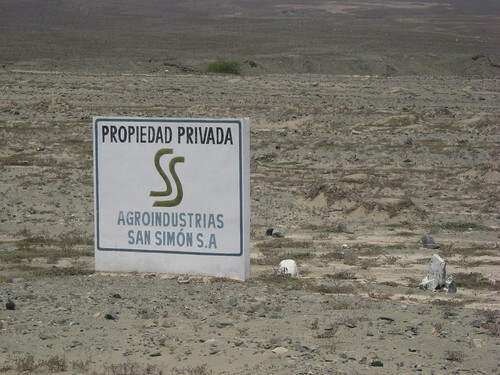 I reached the famed dirt road that is a shortcut east into the Santa River valley, a private mining road that avoids heading down the coast to Chimbote. I’m not sure what cyclist was the first to try this route, but this little nugget of knowledge has been circulated amongst cyclists for a while now. It was on this road I ran into Tommy, a French cyclist who started in Bolivia I believe. This is the first time I’ve run into a cyclist on the road heading the other way in a long time. Heading up the valley and away from the coast, it was hard to believe I was heading back into the mountains. Everything seemed rather small, but I knew within 150 miles I would be up at 10,000 feet again. In a matter of 50 miles the clouds were gone and a nice warmth could be enjoyed. The whole area sees lots of mining activity, though I don’t know many specifics. 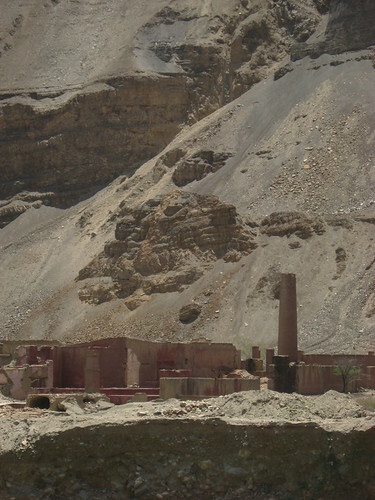 Lots of the operations had been abandoned leaving ghost towns. The first day riding along the Santa River reminded me a lot of Utah because of the colors of the rock, mostly reds and browns. It was hard to have a sense of scale, the mountainsides were covered in layers of chipped stone that looked like running watercolors. I’d ask myself if it would take an hour or a day to scramble up these slopes, but didn’t stick around to find out. On my way up to the town of Yuramarca, I noticed many cacti on the side of the road covered in what might appear as a blight of sorts, a fuzzy white splotches. From my previous (future?) incarnation as a weaver in the Teotitlan area of Oaxaca, I knew this was the cochineal, an insect used for its deep reddish-purple pigment in fabric dyes and paint. I picked a few off and dabbed some splotches on my bandana, lest I ever forget I was in Peru. 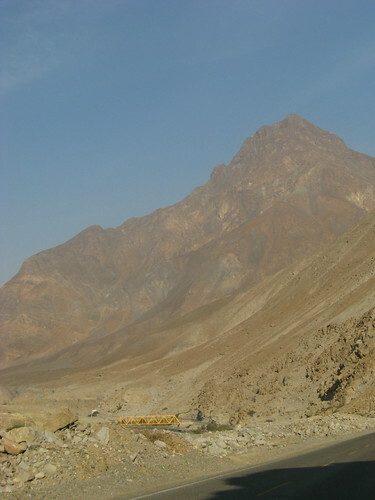 The intensity of the mountains kept getting turned up a notch at every turn in the valley. But still rather barren, and to an untrained eye like mine, hard to see many signs of life save a few patches of irrigated land. I left Yuramarca with my water bottles full and plenty of groceries. 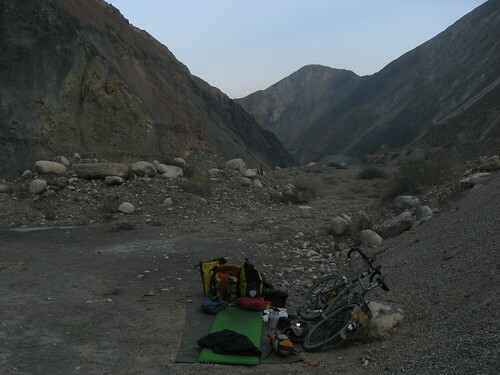 I was determined to camp that night, something I had been doing to little of in Peru. About 5 miles out of town, I was in the middle of a quiet valley and found a gravel pullout that lead to a concealed spot just out of sight of the road. The folks I had talked to earlier in the day made it sound like it never rained, so I decided to sleep without my tent. This is the first time I’ve done this on the trip, and rates as one of my top camping spots. A couple times an hour a car could go up or down the valley, its headlamps briefly lighting up the valley. But other than that I was undisturbed, and spent time staring at the stars, realizing I’m now in the southern hemisphere and don’t recognize the constellations. A little windbreak made out of my panniers, for there is a constant tailwind for those travelling from the coast south into the valley. The next day a few miles brought me to Huallanca, where the road climbs up. 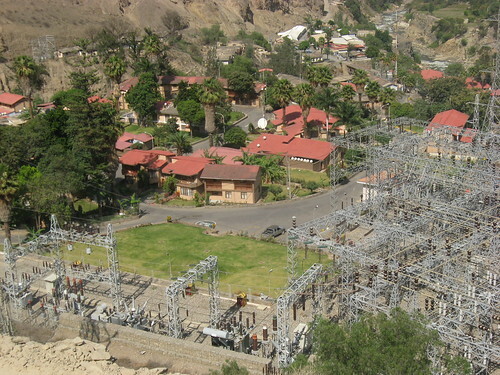 This was one of the tidiest towns I’ve seen in Peru, most likely due to the hydroelectric project on the river. Duke Energy’s compound looked more like a private resort, with a swimming pool, sports field, lawns and palm trees. 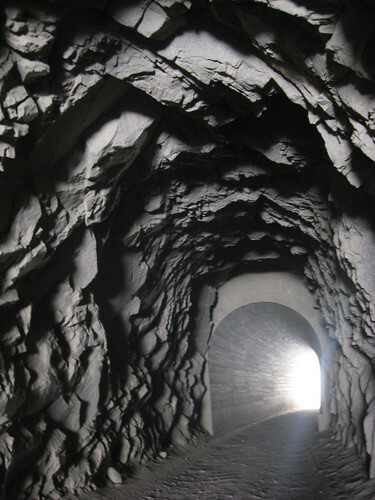 The ride up brings you to the start of Cañon del Pato, a narrow canyon with its 35 tunnels in the span of about 10 miles. Most of the tunnels were pretty short and took only a few seconds, but then there were the ones that you couldn’t see to the end of as they were on a curve. The only safety precautions are signs asking drivers to honk before entering a tunnel, but of course this does little for the cyclist trapped in here! Fortunately I only encountered two cars, coming towards me, so they pulled over far enough. 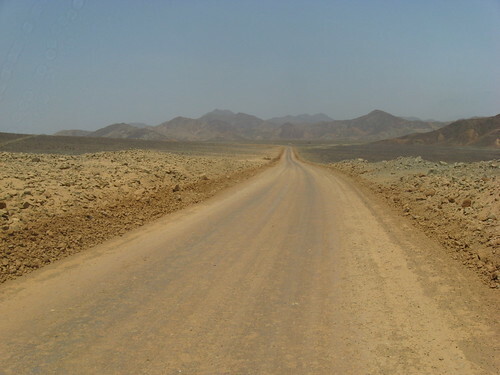 But the anxiety caused by biking in the dark, and the awful grinding noise made by the stones I couldn’t avoid running over with my new rim, meant I was happy to be done with this stretch, and on to a paved road. 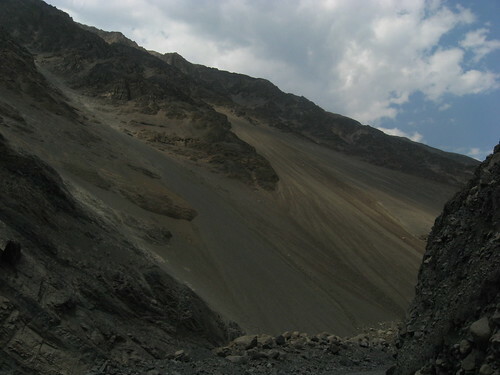 After the narrow canyon, the valley opened up and had a noticeable change. 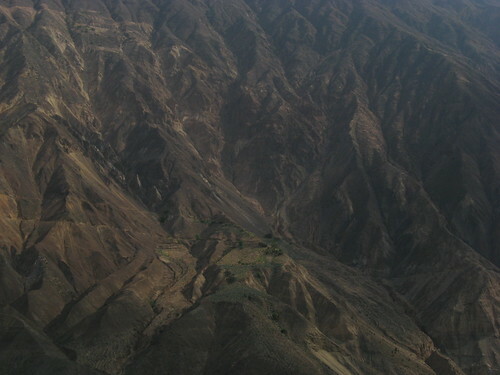 The barren slopes were now covered in shrubs and lots of little farms. 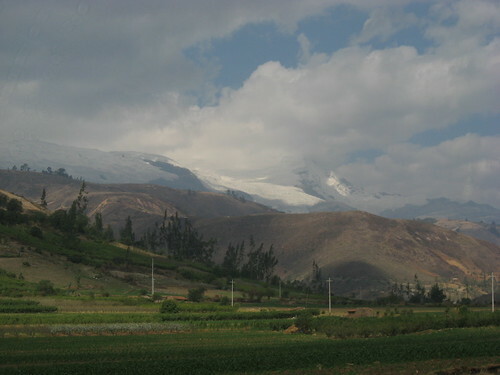 And of course, views of the peaks of the Cordillera Blanca, named for the snow covering the mountains. After 4 days of biking from Trujillo I made it to Huaraz. Here I ran into Greg, who I’d last seen in Cajabamba before I got sick. 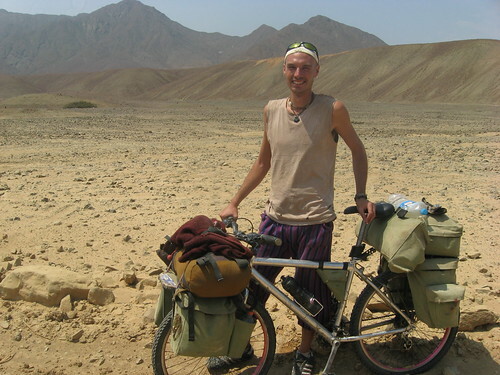 Greg’s been coming to Peru for over two decades to hike and then mountain bike, so he’s plenty familiar with the area and is good friends with the Olaza family, who run a hotel. Normally I’d never stay at a place like this but the connections mean a cyclist friendly rate. It is a nice treat to stay at a place where the bathroom is spotless, the sheets are clean, the water is for real hot, and there is no sign in the room asking guests to please not spit on the walls (!). And I can tell you that yes, people do spit on the walls in cheap lodging. I usually sleep in my sleeping bag in those places. 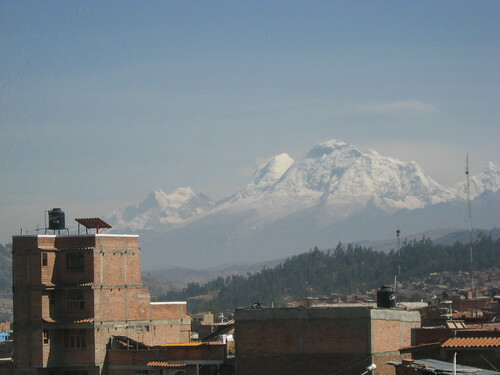 The city of Huaraz is a destination for trekkers and mountain climbers looking to conquer any of the more than 30 peaks over 18,000 feet in the area. 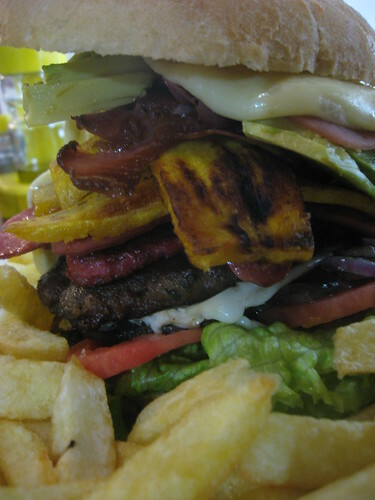 As such there is a noticeable presence of foreign cuisine, including the most ridiculous burger I’ve ever eaten. Among other things, avocado, egg, fried plantain and sausage. It was more like eating a casserole, and after having this for lunch, I didn’t eat dinner. The view of the mountains is incredible, though a little spoiled by the buildings in town. Tomorrow Greg and I, and Canadian cyclists Torrey and Lucie who I got to know in Trujillo, are heading a little further south before we head east into the Huarascan National Park and over the Cordillera Blanca. The route will take us up to elevations of over 15,000 feet! Matt! What a fantastic post! 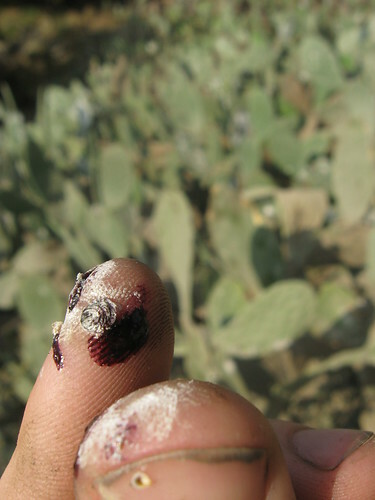 I read a book on early textile dying last winter and literally gasped when looking at the picture of the cochineal and it’s magic-purple/redness on your finger. Also…I love the pictures. They tell a great story. Enjoy the mountains, the company, and hopefully more good camping. The cool thing with cochineal is that you can mix lime juice with it and it turns to a lighter red-orange. Yeah, these pictures are great Matt! Good luck in the mountains! Hey Matt, I had never actually read your FAQ, but just did. That was nice to get the ‘big picture’. I check in with you about once a week on your blog. We have a U of Michigan gal from our church in Chile until mid-Dec. doing study abroad. I am pretty sure she is in Santiago. Don’t know when you might be getting down that way. Stay safe! Our Tim heads back to Seattle on Wed. for his second year of college. Kristin is applying to six or more now in her HS Sr. year. Generally try to avoid big cities, so Santiago isn’t on my intended route. But you never know where I’ll end up.